One of my favorite newer stabilizers is the self-adhesive wash-away mesh type. This stabilizer can be pricey, but it stands alone when you need the unique advantages offered by this highly evolved specialty product. 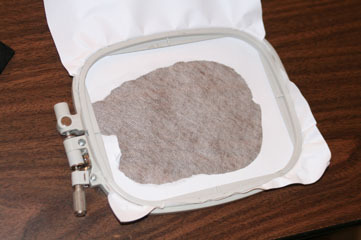 The item being embroidered must be compatible with water, so you wouldn't choose this stabilizer type to embroider velvet or satin. But consider one of the more unstable materials that like to creep and crawl that can withstand moisture. 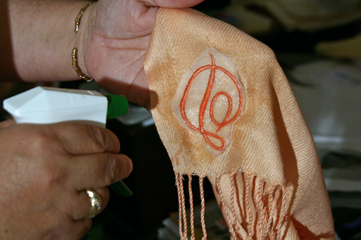 Those who have experimented with embroidering on a Pashmina know that this is one of the most difficult embroiderables, yet they just beg to be embroidered. Fortunately water-soluble self-adhesive stabilizer is a great solution. The challenge with most Pashminas is that they are somewhat loosely woven and the yarns spread easily. If I didn't know better, I would swear that the yarn in these oversized scarves are trying to run away from the needle! to expose an area of self-adhesive mesh where I can apply the Pashmina. 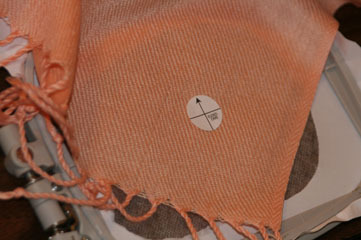 apply a target sticker that indicates the placement and direction of the monogram. 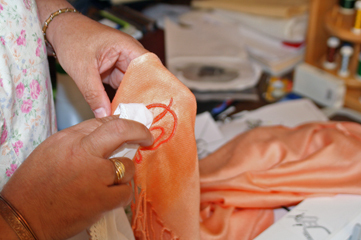 I adhere the pashmina by finger-pressing it onto the self-adhesive base. When the embroidery is complete, I remove the scarf from the stabilizer base, and cut away the large pieces. Then I spray the remainder with a spray bottle. 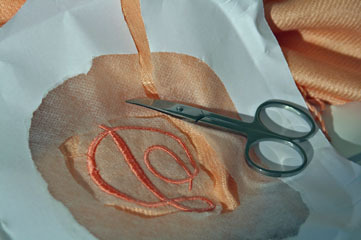 I blot to lift sticky residue, keeping the fabric soft and drapey. 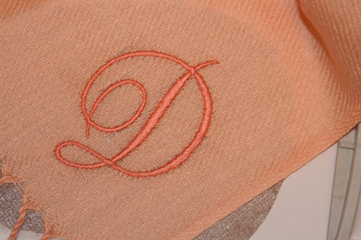 When dry, the result is a distortion-free monogram. This stabilizer is one of my favorites. Very simple, I like projects like this! I really want to do this with my scarf. Will look for this stabilizer. I would never put water on my pashmina. It is from the belly of live goats which is where much wool comes from. I do pashminas for brides and I use tear away ONLY. I have used the wash away and had it leave marks. Wine Wraps That Aren't Just for Wine! Look Mom! No Zippers!